Alfalfa has been consumed since ancient times for its great nutritional value. However, modern science has shed light on its medicinal properties, which are gaining popularity around the world. The use of alfalfa dates back thousands of years when it was first cultivated in central Asia. This perennial eventually spread across the continents until it reached North America, where it is widely consumed for its nutritional value and medicinal benefits. The alfalfa plant has been historically used to feed humans and animals alike because of its plentiful nutrient content, but modern scientific research has uncovered alfalfa medicinal properties. Relieving PMS and menopausal symptoms. 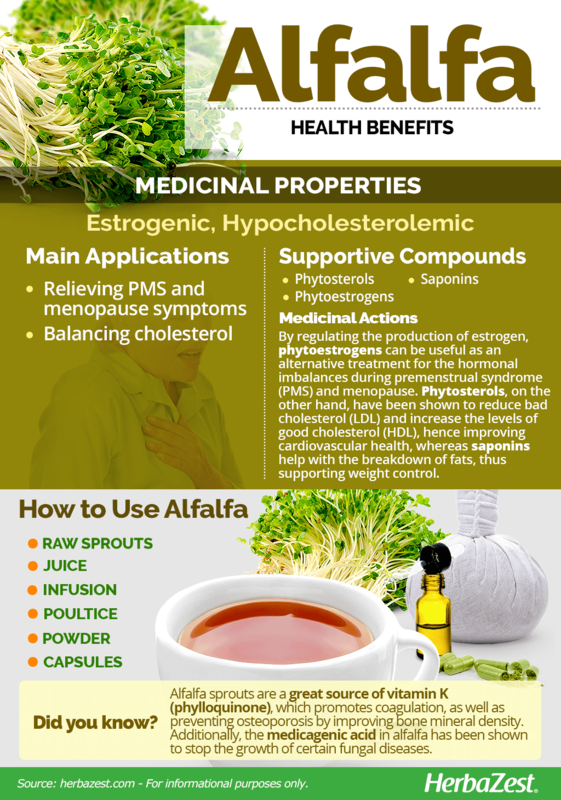 Alfalfa promotes estrogen production, which can contribute to restore hormonal balance during menopause, as well as reducing the symptoms of premenstrual syndrome. Balancing cholesterol levels. Alfalfa properties include the ability of lowering cholesterol absorption, thus helping reduce the risk of cardiovascular disease. Additionally, alfalfa has been shown to improve the break down process of lipids in the organism, contributing to weight management, and it also has proven useful in the treatment of fungal infections. Alfalfa health benefits have been attributed to several types of phytonutrients, mainly phytosterols, phytoestrogens (coumestrol), alkaloids, amino acids, and saponins. 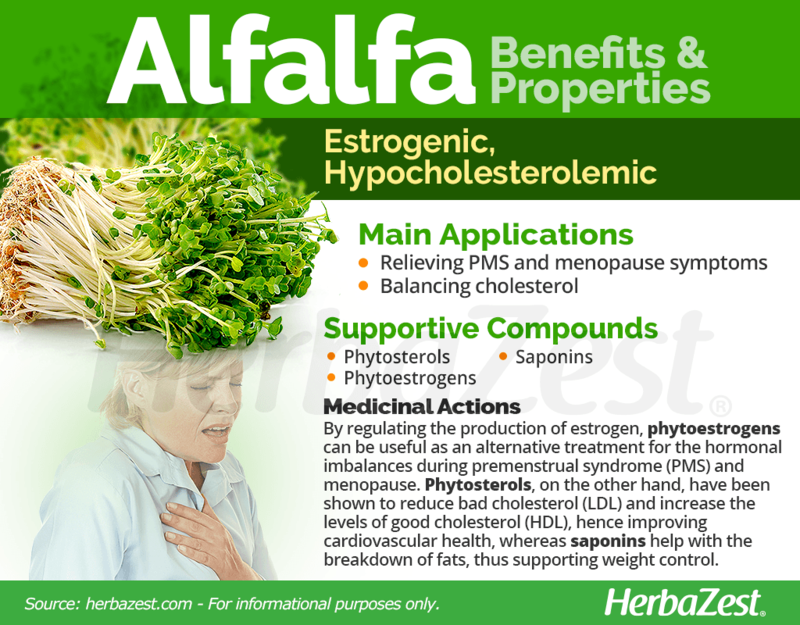 Alfalfa is a good dietary source of phytoestrogens,which induce similar effects to true estrogens. The similarities, at molecular level, of estrogens and phytoestrogens allow the later to mildly mimic the first, sometimes acting as antagonists. By regulating the production of estrogen, phytoestrogens can be useful in the alternative treatment of low-estrogen conditions, such as hot flashes, during menopause, or the hormonal fluctuations that cause the premenstrual syndrome (PMS). The saponins in alfalfa have been shown to stimulate the activity of lipase, an enzyme that breaks down fat, helping with metabolic processes and preventing excessive weight gain. On the other hand, phytosterols are plant sterols that compete with and decrease low density lipoproteins (LDL's) while preserving the good high density lipoproteins (HDL's). These alfalfa compounds, in combination with saponins, lower the absorption of cholesterol and help reduce the risk of cardiovascular disease. Moreover, the medicagenic acid, another type of saponin in alfalfa, has been shown to stop the growth of certain fungal diseases. It has proven effective against Cryptococcus neoformans, a fungus that infects the lungs and central nervous system. Similar estrogenic properties can be found in black cohosh, flax, and soy, whereas avocado, olive, and sacha inchi are also able to keep cholesterol levels in check. Alfalfa is safe for ingestion, but it should not be taken for a long terms in supplement form, since it has been shown to cause similar reactions to those experienced with the autoimmune disease systemic lupus erythematosus (SLE). The onset of SLE has been linked to those taking alfalfa tablets regularly. Alfalfa can cause inflammatory reactions when large amounts of seeds or sprouts are consumed. As a result, people suffering from autoimmune diseases, such as SLE, multiple sclerosis, or rheumatoid arthritis should avoid alfalfa. Those diabetics taking medication must be aware that alfalfa can lower blood sugar; therefore, its consumption should be carefully monitored. The blood clotting action of alfalfa may negatively interact with blood-thinning medications, such as warfarin, decreasing their effectiveness. Due to its estrogenic activity, pregnant women and breast cancer patients should avoid alfalfa altogether. Alfalfa can also increase skin sensitivity to sunlight. It is recommended to seek medical advice before start taking alfalfa to treat any health condition. 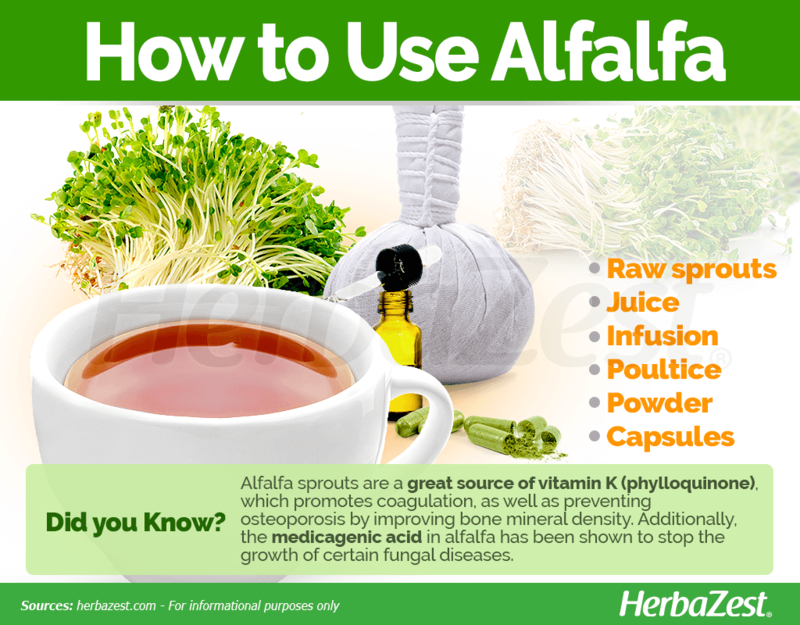 Alfalfa sprouts are a great source of vitamin K (phylloquinone), which promotes coagulation, as well as preventing osteoporosis and reducing the risk of fractures by improving bones mineral density. Additionally, alfalfa sprouts provide good amounts of important nutrients, mainly vitamin C (ascorbic acid), which plays a key role in immunity and also aids iron absoption; vitamin B9 (folate), crucial for fetal development; manganese, which helps with carbohydrate metabolism and calcium absorption; magnesium, important for energy production; phosphorus, necessary for bones and teeth formation; and vitamin B2 (riboflavin), which helps prevents age related diseases and supports the formation of new red blood cells. Alfalfa sprouts also carry small amounts of other nutrients, such as vitamin A (as beta-carotene) zinc, vitamin B1 (thiamin), and iron. 100 grams of alfalfa sprouts provide 23 calories, as well as 8% of the daily value for protein and dietary fiber, respectively. The leaves and sprouts of alfalfa are edible and can be used in variety of ways. However, when it comes to the treatment of health conditions, medicinal preparations are the best way of consumption. Sprouts. 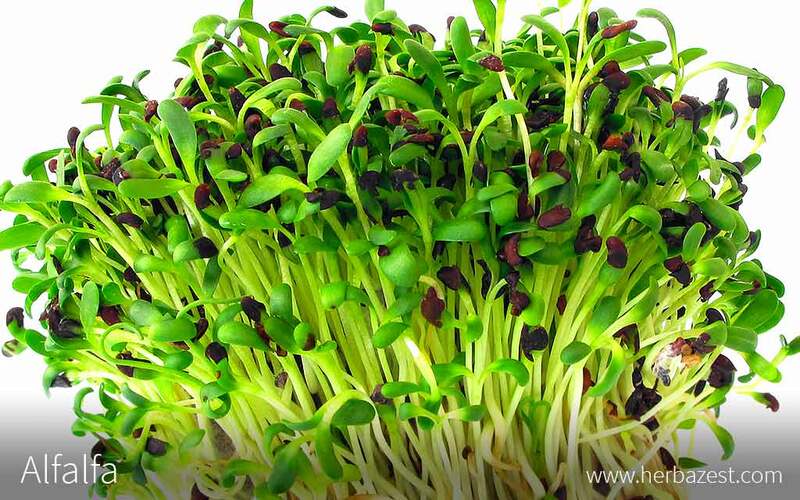 Alfalfa sprouts can be bought or germinated at home from certified alfalfa seeds. They are regarded by chefs and cooks around the world as a great way to enhance the nutritional value of many vegetarian preparations, such as wraps, salads, and sandwiches. In order to fully reap alfalfa health benefits, it is important to disinfect it thoroughly before consumption, since alfalfa sprouts can contain harmful bacteria and carry a risk of foodborne illness. Juice. In one study, four to six grams daily of sage leaf and alfalfa extracted juice helped eliminate hot flushes and night sweats of menopausal women. This is believed to be due its similarity to soy in estrogen-like actions. Infusion. Fresh or dried, alfalfa seeds, sprouts, and leaves can be steeped in hot water to make an herbal tea that can help relieve stomach issues. Poultice. Alfalfa seeds were also traditionally made into a poultice to treat boils and insect bites. Powder. The ground leaves of alfalfa can be mixed with food, smoothies, and drinks. Capsules. Most alfalfa supplements come in capsule and tablet form, in a standardized daily dose, allowing for a convenient, fast intake. Raw sprouts and leaves of alfalfa are available year round in most supermarkets, as well as in grocery stores or local markets around the world. The most common presentation of raw alfalfa is the whole sprout. For gardening purposes, alfalfa seeds are readily available in plant nurseries and online. On the other hand, alfalfa powder can be easily purchased from online retailers. Alfalfa capsules and tablets are mainly found in specialized health stores or through online retailers. Care should be taken in reading the labels because the concentration levels and quality of herbal supplements vary depending on the brand. Alfalfa can tolerate a wide range of growing conditions. So, its cultivation is not limited to certain regions. 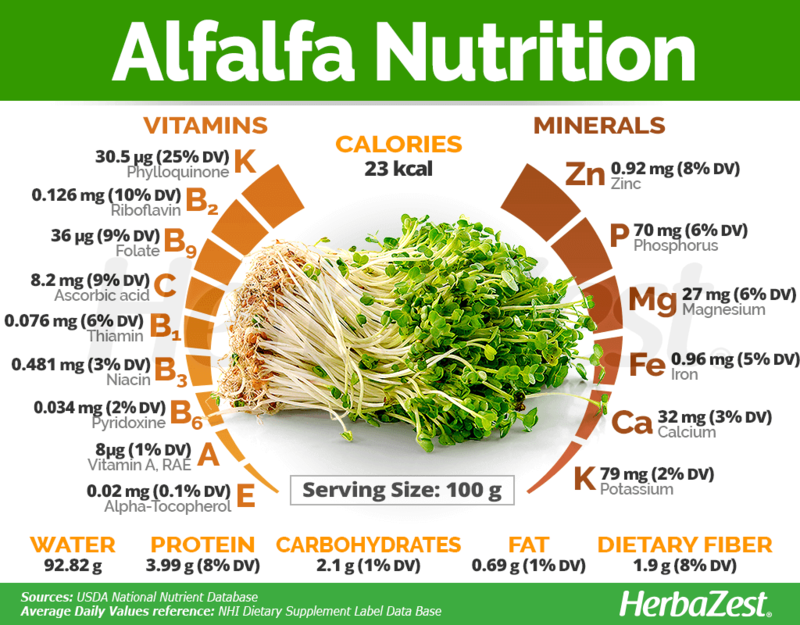 Alfalfa requires a deep, well-drained, fertile soil, with a pH level of 6.5 - 7.0. The plants should have access to full sun. Seeds should be planted no deeper than half an inch (1.3 cm) below the soil, and they should sprout 7 - 10 days after being sown. Temperatures of 68 - 85°F (20 - 29°C) during seedling development are optimum; however, as the plants continues to grow, slightly cooler temperatures, around 60 - 75°F (16 - 24°C), are ideal. Alfalfa needs to be watered in moderation. While soil moisture is necessary for nutrient absorption and development, over-watering can stop root growth. When grown outdoors, potential pests of alfalfa include potato leaf hoppers and alfalfa weevils. Common diseases that can affect alfalfa include sclerotinia root, bacterial wilt, and leaf spot. Many of these occur in humid regions. More detailed information about growing alfalfa can be found in the herb garden section. Alfalfa (Medicago sativa) is a perennial herb. It develops trifoliate leaves and clusters of flowers which can range in color from yellow to purple and blue. Alfalfa (Medicago sativa) is classified as a legume, and it is also the most economically important member of the genus Medicago, which comprises over a dozen species that are significant pasture crops and belongs to the Fabaceae family, which contains over 19,400 species spread out over 730 genera, including economically important plants such as beans (Phaseolus vulgaris), fenugreek (Trigonella foenum-graecum), licorice (Glycyrrhiza glabra), soy (Glycine max), and tamarind (Tamarindus Indica). Medicago sativa is divided into five subspecies: M. sativa subsp. sativa, M. sativa subsp. caerulea, M. sativa subsp. falcata, M. sativa subsp. glomerata, and M. sativa subsp. glutinosa. After thousands of years of human cultivation, the germaplasm of alfalfa has become very complex in order to allow adaptability to a wide range of climates and soil conditions. Only in North America, at least nine varieties from different parts of the world have been identified. From these, over 280 cultivars have been created, being some of the most popular ones 'Vernal' and 'Ranger', both of which account for about 52% of the cultivated alfalfa in the U.S. Some alfalfa cultivars are bacterial-wilt-resistant, such as 'Buffalo', 'Cayuga', and 'Ranger', while others are resistant to spotted alfalfa aphid, like 'Cody' and 'Zia', and to stem nematodes, such as 'Lahontan' and 'Washoe'. Alfalfa is believed to have been around for over 4,000 years. It was first cultivated in southern Europe and West Asia. Around 1100 CE, alfalfa spread from Iran to Spain and, after crossing France, Belgium, and Holland in subsequent years, the perennial arrived to the United Kingdom in 1650. Spaniards and Portuguese introduced alfalfa to Mexico and Peru during the early colonization period of the Americas, in the 16th century. From there, it spread across South America and into the southern states of North America. By 1850, Chilean alfalfa was grown in California, and it is believed that missionaries brought alfalfa into other southern states, such as Texas, New Mexico, and Arizona. Since the first cold-resistant alfalfa variety - 'Grimm' - was successfully cultivated in 1875, the modern industry has begun to develop in the temperate zone. Within the western states of the United States, alfalfa is considered a critical rotation and cash crop. It has also grown to be a key part of western agriculture, being ranked the nation's third largest commodity after corn and soybeans. The United States is the biggest alfalfa producer in the world, with 11.9 million hectares that means 41% of the global market. The rest of alfalfa production is spread throughout the continents, with Europe producing 25% of the world's supply, South America 23%, Asia 8%, and Africa and Oceania together the remaining 3%. The global area of alfalfa production is at 30 million hectares. Fodder. Alfalfa has traditionally been used to feed farmyard animals. Gardening. Alfalfa plants are often applied as organic fertilizer. Alfalfa medicinal properties range from helping lower cholesterol absorption to aiding with menopause symptoms, which make it a great addition to a balanced diet. It is also easy to grow in any home garden and can be purchased in a variety of medicinal forms. Handbook of Energy Crops, Medicago sativa L.
Zeitschrift für Naturforschung, Stimulation of pancreatic lipase activity by saponins isolated from Medicago sativa L.